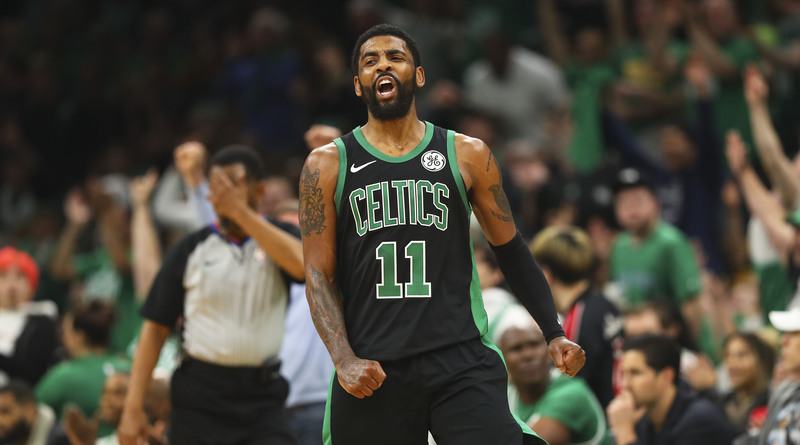 In terms of optimism, the high point of the Celtics' season—one that would nearly be derailed by locker room rifts, inconsistent effort and questions about the commitment of the franchise player—arrived on a cool October evening, in a chandeliered ballroom on the ground floor of the Westin hotel near Boston's waterfront. There, a few hundred season-ticket holders and a slew of deep-pocketed, beer-buzzed corporate partners gathered to cut checks for the Celtics Shamrock Foundation and listen to players and coaches speak. The team had just completed a lackluster 1–3 preseason, but what did that matter? Small forward Gordon Hayward was coming back from a gruesome ankle injury, star point guard Kyrie Irving had publicly declared he was staying for the long haul and LeBron James had decamped to the opposite coast. In his opening remarks, emcee Mike Gorman—a team broadcaster for nearly four decades—welcomed the crowd to "the dawn of what is one of the most anticipated Celtics seasons in a long, long time." Players smiled. Coaches laughed. But underneath there were concerns. Brad Stevens had them. The sixth-year coach had taken his last two teams—one a ragtag group of vets, the other injury-ravaged—to the conference finals. Now with a full complement of players, Stevens was realizing how difficult it was going to be to manage his players' minutes. "There were some real red flags with how we were playing," he says. "We got our butts kicked in three of the four games. We knew it was going to be quite a challenge to ask guys to take a lesser role in some cases. Even if you maintain your starting role, you're getting less opportunity. That's really hard, and we could see early it was going to be hard." Team president Danny Ainge also had doubts. In the preseason opener, Boston built a double-digit lead over the Hornets. "I was watching that, and it was like, 'Wow, this team is so potent,'" Ainge says. "There was so much passing." In the second half, the Celtics scored just 37 points and lost by seven. "The rest of the preseason, it looked like everyone was playing for individual goals," says Ainge. "I think that was pretty obvious." Players felt it too. "We were all a little skeptical about how this team was going to work," says guard Marcus Smart. "A lot of guys are in the development phase of their own careers. They want to continue to progress individually. We have a lot of talented guys. It's kind of hard to get everyone the ball." Early on, that was evident. A 6–2 start was offset by a 4–8 stretch. A 10–1 spurt beginning in mid-January was followed by a 2–6 run. The starting lineup was overhauled. They scored on everyone in clutch minutes (an NBA-best 125.3 points per 100 possessions) while stopping no one (114.4). The locker room grew more polarized; by March, swingman Jaylen Brown described it as "toxic." On one night the Celtics waltzed into Oakland and beat the Warriors by 33; on another, they let the Suns trample them on the TD Garden floor. Boston entered the playoffs as a 49-win fourth seed, edging a Pacers team playing without its only All-Star, to earn home court advantage in the first round. Smart, Boston's best defender, is lost for at least a month with a torn oblique suffered in a meaningless late-season loss to Orlando. A stingy, physical defense (a 77.1 defensive rating, the team's second-best single-game playoff mark since 1984) propelled the Celtics to an 84–74 win over Indiana in Game 1 of the Eastern Conference quarterfinals while a sloppy offense (17 turnovers) highlighted Boston's vulnerability. A first-round loss isn't inconceivable. A trip to the Finals isn't, either. It's late February, and Terry Rozier is in the stands at Welsh-Ryan Arena, on the Northwestern campus, watching practice wind down. Irving's season-ending left knee surgery last April opened a starting slot, and Rozier barreled through it. He outdueled the Bucks' Eric Bledsoe in the first round. Drew Bledsoe—the former Patriots quarterback turned vintner—pledged to name a wine after him. Rozier averaged 36.6 minutes and 16.5 points in the postseason. His Scary Terry brand was everywhere. Rival executives sized up Rozier as a top-tier free agent when he hits the market this summer. The minutes squeeze is the fallout from a good team drafting high (and well). Thanks to Ainge's wheeling and dealing, the Celtics were able to pick Brown third in 2016 following a 48-win season and get small forward Jayson Tatum in the same spot the following year, after a trip to the conference finals. Unlike, say, the 76ers, Boston had no open runway for their picks to develop. The Celtics dodged this problem last season, when Hayward went down five minutes into the opener, before Irving's injury created the opportunity for Rozier, the No. 16 pick in '15. The reality of finding time—and shots—for nine NBA-level starters penetrated the locker room early, and was compounded by last season's success: Tatum, Brown and Rozier were all emboldened by the their roles in the team's playoff run. "I think there was a sense that they deserved something," says Ainge. "The reality of it is that this league is tough. You have to earn everything, every year and every day. Just like a coach has to earn the respect of players, a player's job is to prove to the coach that he needs them on the court to win. It's not a coach's responsibility to give you a chance. It's your job to earn a spot." The adjustment proved difficult. Brown's scoring dipped from 14.5 to 13.0, while his three-point percentage fell five points to 34.4%. Tatum, an offensive hub as a rookie, saw his shooting numbers drop as well; he hit 43.4% of his threes last year and just 37.3% this season. Coaches have encouraged both to get creative. Brown, who was moved out of the starting lineup in December, was told to keep running, to keep looking for transition buckets, to use defense to spark easy offense. Tatum has been pushed to initiate offense off rebounds. "I tell him all the time, 'We don't have to call a play for you,'" says assistant Micah Shrewsberry. "If you rebound it, bring it up. That's your play. We can call that 10 times a game." Still, Brown and Tatum are two of eight Celtics who played at least 50 games and averaged at least 22 minutes; no other playoff team had more than six. With Smart likely gone until at least the conference finals, minutes have opened up. Brown has slid back into the starting lineup, Hayward backs up both wing spots while forward Marcus Morris—a steady presence in the first half whose numbers dipped in the second—gets more opportunities. Much of the responsibility for keeping everyone engaged has fallen on Irving. To a degree he has been successful creating for his teammates—his 6.9 assists per game are a career high. But Irving has been a paradox. On the court he has been his usual brilliant self, knocking down threes and finishing at the rim while showing no signs of any lingering effects from the surgery that cut short last season. Off the court, though, his leadership has been clumsy. He has alternated between scathing criticisms of his teammates and praise. 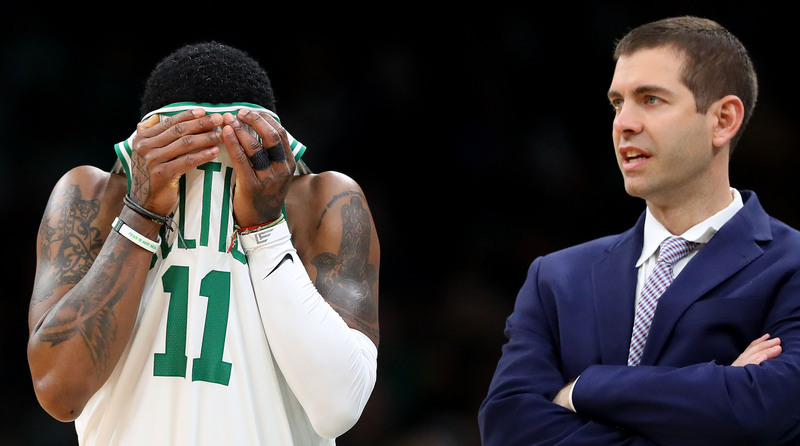 He has expressed concern about the state of the Celtics as well as indifference, while also noting, after a 10-point loss to the cellar-dwelling Bulls in February, that everything would be fine come playoff time because, "I'm here." After saying in October, "I plan on re-signing here next year," the free-agent-to-be told reporters in February, "Ask me July 1." Then he added, "I don't owe anybody s---." In Cleveland, Irving craved the chance to be the face of a franchise, yet this season he has struggled with the responsibilities that come with it. Free agency—which most elite players crave—seems to weigh on Irving like an anvil. "I think Kyrie's heart is in the right place," says Ainge. "Leadership is hard. I think when he is at his best is when he tries to have an impact on the game he is playing, and he tries to inspire his teammates with his play on both ends. I think it's that simple. That's where players earn respect. Not by words, not by team meetings. You earn respect with how you play." Both fierce competitors, Stevens and Irving seek success by different means. Stevens is process-oriented, believing that winning in the playoffs comes from habits built during the regular season. Irving's basketball education came with the Cavaliers, who often sleepwalked before flipping the switch in April. Gradually, the two have become more in sync. "Our relationship has grown tremendously," says Irving. "Just in terms of our communications of what he likes and what I like—but ultimately what's best for our team and how you get the most out of guys. It's made my job a lot easier, going to the sideline knowing that we're on the same page." It helped, of course, that as the season wound down, there was one significant in-house improvement. Gordon Hayward tugged at the laces of his left shoe earlier this month, pulling them tight. It's been 18 months since his lower leg snapped and his left foot twisted in a way it shouldn't as he landed awkwardly, an injury that was one of the NBA's most horrific. There was surgery and rehab, a second surgery and more rehab before the challenge of rediscovering his game could even be tackled. "The physical limitations have been one thing," says Hayward. "But mentally, believing I could go out and do it, that's been a challenge too." Like most teams, the Celtics assign assistants to work with specific players. For Hayward, it was Scott Morrison, a former G-League coach who in the summer of 2017 was beginning his first season on Boston's bench. Days after Hayward announced his decision to leave the Jazz for Boston, Morrison flew to Hayward's home in San Diego and watched him sign his four-year, $128 million max contract. "I remember thinking, This guy is an All-Star, how can I help him?" says Morrison. "And he said to me, 'Your job is to make me better.'" After the injury, that job changed. It wasn't about making Hayward better anymore. It was about just getting him back to where he had been. Hayward's confidence fluctuated. He watched film and wondered why his body moved so slowly. Off the dribble, he looked to pass rather than take the ball to the rim. He sought out a psychologist to get him through the rough stretches. "It's hard to compare it to anything," says Hayward. "I was just trying to work my way through it." Watching Hayward, Morrison didn't see a player with physical limitations—just one who needed to be convinced that his abilities were still there. Early in the season the coach would spot a hard cut or a quick burst reminiscent of Hayward's preinjury days. He would note it, cut film of it and run it with a clip of a similar move he made in Utah. "He had it in him," says Morrison. "He was just afraid to use it." Morrison used advanced metrics and analysis for positive reinforcement. When Hayward struggled to score, Morrison showed the number of shots he created for others. When his shooting percentage dipped, he highlighted how many times Hayward made a cut that forced defensive help. 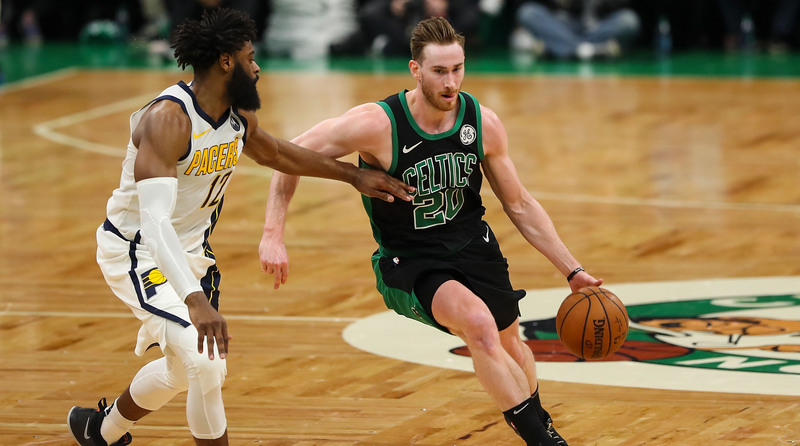 A move to the bench in November alleviated some of the pressure, while allowing Hayward to play with the ball in his hands more with the second unit. Stevens says he never talked to Hayward about getting his game back "because I didn't ever want to insinuate that he couldn't go out there and just have it." Lately, he has. Hayward says things began to turn in mid-January, when the ankle soreness faded and the legs began to come back. In December he made just 37.0% of his shots. In January, it was 46.5%. In February, 51.3% before jumping to 55.6% in March. Hayward's willingness to play through contact, says Morrison, is the most notable improvement. In Utah, Hayward got to the free throw line at least 5.9 times per game in each of his last three years there. This season Hayward is averaging just 2.8 attempts. In early April, against Miami, with Boston still fighting for playoff positioning, Hayward scored 25 points—12 of which came at the free throw line—in a 112-102 win. "It's gone almost exactly like I would have expected," says Stevens. "You look at how he is moving now—and more important than anything, how he is moving laterally now, defending—this is exactly what we thought. We thought he would be peaking right now or getting back to where he would be even more comfortable and ready to make an impact. I feel really good about him heading into the playoffs. I have no concerns." Behind the desk in Stevens's office is a wall-sized aerial image of Boston Garden, taken before a 1986 game. It was the last championship season of the Larry Bird era, and it would be 22 years before Paul Pierce, Kevin Garnett & Co. would win another. Ten postseasons have come and gone since, with no title to show. Stevens has known since well before that night in the Westin that this season would be challenging. And while he hid his worries well that night, people around him have noticed his frustration. "I expected this to be difficult for Brad, and it has been," says Ainge. Hayward—whose connection to Stevens dates back to the two seasons they spent together at Butler—sees what this year has taken out of him. "I think you can tell," says Hayward. "I've talked to him—he's a competitor, he hates losing." Stevens solicits advice from everywhere. "Coaches, ex-coaches, football coaches, baseball coaches," Stevens says. Early in the season, Mavericks coach Rick Carlisle relayed something Hall of Fame coach Chuck Daly once told him. "He said, 'Some years it just takes a while for everything to come together,'" says Stevens. "You are going to have ups and downs and the plane is going to flip over. You just have to land it. In the midst of our biggest struggles, I would wake up in the morning and just say, 'Land the plane.'" No one is predicting a championship this season, not with the Warriors juggernaut lurking out West. Still, the possibility of a run to the Finals—which seemed improbable, if not impossible, in January—has new life. Ainge sees a team that casts aside its minutes envy when winning becomes the only thing that matters. Early in the season, says Stevens, "When someone was out, we played better." Down the stretch, Boston was at its best at full strength. Last year the Celtics had the NBA's best defense, which was anchored by center Aron Baynes; this year, as Baynes struggled with various injuries, the defense slipped to sixth. Boston's defensive rating was 107.0 this season. When Baynes—now healthy—paired with 6'10" veteran Al Horford, that number dropped to 92.0. The players see a change. A real change. Boston won six of its last eight at the end of the regular season. "I've wanted to be optimistic, but all year I never felt that we had turned a corner," says Horford. "We showed some flashes, but then we don't look the same. But right now, we're starting to figure it out as a group. We're really playing good basketball. I still feel like we can put this thing together." The season is salvageable. The future of this team may not be. Irving's waffling has some believing he is ready to bolt Boston. Ainge isn't one of them. He communicates with Irving regularly and believes the relationship between player and team remains strong. A five-year, $190 million max offer will be there for Irving on July 1. If he accepts, Boston will direct all its efforts to New Orleans, to Anthony Davis. Ainge had opportunities to retool the roster midseason. He passed, preferring to keep the war chest intact. Beyond its well of young talent, Boston will have at least three first-rounders in this year's draft; a fourth, Memphis's top-eight, protected pick, could be conveyed at next month's draft lottery. If Davis is put up for auction, Ainge will not be outbid. For this group, the next weeks—or months—could be a last hurrah. The upstart team turned front-runner has morphed into the NBA's biggest postseason wild card. With a surplus of talent, the Celtics could roll into the Finals and throw a scare into Golden State. If they unravel—again—the end can, and will, come a lot sooner.